Discharge Medications – Cardiovascular Associates, P.C. 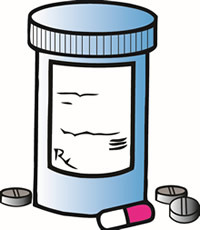 Many of your medications may be changed after surgery. Do not hesitate to ask if you have questions about medications you have been taking which you are not given at discharge. You will need to continue medications for diabetes or thyroid if you were taking them before surgery. If you were taking Tagamet or Zantac, these may be resumed. It is OK to use nonprescription laxatives, antacids or cough medicines. In the hospital, your blood pressure is usually lower. You are at rest more and removed from the stress of daily life. You may be sent home on less medication for your hypertension. Generally, as you return to normal life over the next two months, your family physician will need to adjust your medication. You may have been on a number of medications to control angina prior to surgery. Hopefully, you will not need these after heart surgery. If you should have a recurrence of angina, do not hesitate to take nitroglycerin, and call your doctor. If you have had surgery for atherosclerosis, coronary bypass, carotid surgery, or surgery for the leg arteries, you will need to take an aspirin each day. This medication helps prevent clotting factors from sticking to vein grafts or diseased arteries. If you have had a heart valve replacement with a mechanical valve, you will be placed on Coumadin. Coumadin is often called blood-thinner, but it doesn’t really thin the blood. It is an anticoagulant, a drug which prolongs the clotting time. You should NOT take aspirin. Prior to discharge, we will regulate the amount of Coumadin for you to take by checking blood work, Prothrombin Time or Pro-Time. After discharge, you will need to have your physician check your Pro-Time in three to five days. After that, he will check your blood work at regular intervals. You will need to take Coumadin for the rest of your life. It is absolutely critical to your valve function that you take your Coumadin as directed by your physician. Vitamin K plays an important role in blood clotting. Eating foods high in vitamin K may reduce the effectiveness of Coumadin. If you take Coumadin, avoid foods high in vitamin K such as asparagus, avocadoes, broccoli, cabbage, green onions, soybeans, lettuce, spinach, olive oil, and canola oil. Your diet should be modified to minimize foods high in fat and cholesterol. The dietician will be happy to meet with you and your family prior to discharge to discuss your diet. As a start, follow a common-sense diet of fruits, vegetables, fish and poultry. Avoid excessive red meats and foods which are fried. Your doctor may want to check your cholesterol after you are home and back on a routine diet. Alcohol and coffee in moderation are acceptable.